We recently returned from a twelve-day tour of the UK, and it sure was a whirlwind trip! Now that I’ve had some time to process my photos and get back to work, I’m eager to share all the great things we did. In order to make my recap easier to navigate, I’ve divided it up into two parts. This first part will cover all the sights we saw and food we ate during our five days in London, which we used as our starting and ending point for the trip. The second part will cover our seven days driving through northern England and Scotland. Even though the exchange rate has improved between the euro and the British pound after the “Brexit” vote, the UK can still be a really expensive place to visit. We were lucky on this trip and were able to stay with friends who live in the city. Their apartment is located near Aldgate East, which is just a 15 minute walk to St. Paul’s and a 10 minute walk to the Spitalfields Market and Shoreditch areas, which are some of my favorite in the city. In the past, I’ve also booked a hotel in the Blackfriars area (IBIS tends to be a relatively inexpensive option) and in the Kensington area near Nottinghill (also a very lovely neighborhood). Whichever area you choose to stay in, just know that the tube system is fast, reliable, and extensive for getting around the city. We picked up a top-up Oyster card and tube map when we arrived and enjoyed the flexibility that it allowed us. We were also told by our friends that they Oyster card can be used on the ferry boats that travel up and down the river Thames, and that they’re a good alternative if you’d like to travel on the double-decker buses without paying the cost of the tour bus companies (though I often like the double-decker tour buses for convenient travel, cultural and historical information, and sightseeing if I’m new to a city). I should note that this was my third visit to London, so I’ve already done most of the main tourist attractions, including the London Eye, Westminster Abbey, the Houses of Parliament, Kensington Palace, and the Victoria & Albert Museum. On this trip, we really wanted to focus on our particular interests while sightseeing. Churchill's War Cabinet Rooms — This exhibition was recommended to us by a friend of ours, and turned out to be one of the better museums that I’ve visited in London. The rooms where Winston Churchill maintained his command during the bombings of World War II are a kind of time capsule for the period; many of the rooms were simply left as they were at the end of the war until they were rediscovered during the 1980s. There was also a good exhibition on Winston Churchill’s life, including interactive maps, diaries, quotes, and pictures, to help visitors gain a better understanding of the man who helped lead Britain to victory. Buckingham Palace State Rooms — Buckingham Palace is only open to visitors during the summer when the Queen goes on holiday to her castle in Scotland. As such, we felt like we couldn’t pass up the opportunity to see the insides of a working palace. Our tickets included an audio guide that walked us through the various state rooms where foreign dignitaries and visitors to the Queen are received. During our visit, there was also a special exhibition including many of Queen Elizabeth II’s hats and dresses during her reign and the significance of her fashion. I’ve been to Versailles near Paris and to several castles and palaces in Germany, including Ludwigsburg, Charlottenberg, and Neuschwanstein, but Buckingham was by far the most opulent and interesting. Tate Modern — The Victoria & Albert is still probably my favorite museum in London, but since my husband’s artistic tastes are more inclined to the modern, we decided to give the Tate a try. I really liked the introduction to modern art at the beginning of the collection that provided a good overview of artists, genres, and periods with thoughtful questions along the lines of “What is modern art?” and “How do the colors make you feel?”. We also took the opportunity to visit the top floor café, which has a great view across the city. What I like most of all, though, is that the Tate, like all of London’s art museums, is free, which means that you’re not pressured to take it all in in just one visit. Spitalfields Shopping — There are tons of markets around London, but one of my favorites is still Spitalfields. It’s a great combination of stationary boutique stores and pop-up stalls selling everything from artsy t-shirts and jewelry to antiques and second-hand clothing. There are also a ton of food trucks (which I mention in the next section on food), restaurants, and cute shops in the area. 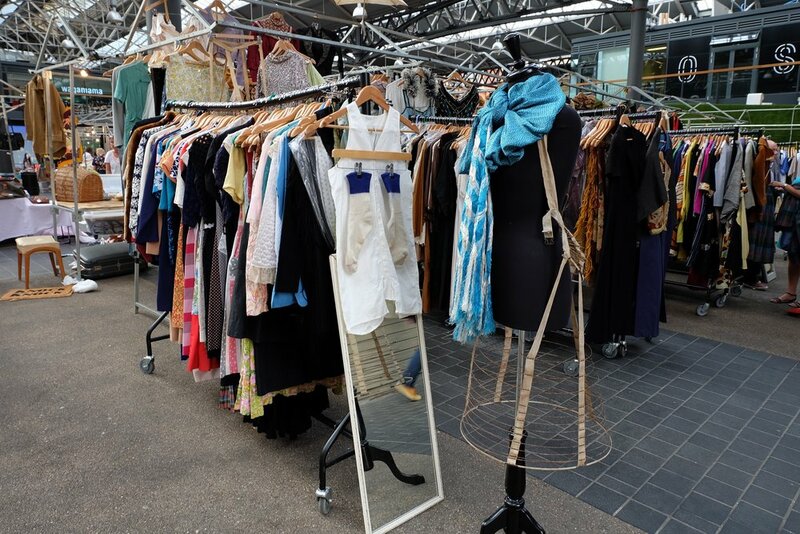 According to our friends, the London market culture really starts at the end of the week and reaches its peak on the weekend, so although Spitalfields is open throughout the week, it’s best to go later if you can to take advantage of the number of weekend street markets, too. Note that most of the stalls don’t really get going until around 10:00 and start closing up about 17:00 or so. Platform 9-3/4 at King’s Cross Station — There are a number of Harry Potter-related activities to do in and around London, but the one we decided on (and the cheapest) was to visit Platform 9-3/4 at King’s Cross Station. There you can have your picture taken with the house scarf of your choice while your luggage trolley seems to disappear into the wall. I wasn’t willing to wait in the extremely long line of adults (and some children) to get my picture taken, but I did enjoy the small gift shop with wands, clothing, stationary, and stuffed animals all related to Harry Potter. Luckily I have more self control than my eleven-year-old self and managed to leave the store with only a few modest souvenirs. Shakespeare at the Globe — Although there are several Shakespeare plays that I’ve read and enjoyed, I’m a firm believer that plays are meant to be seen. That’s why when I found out that Macbeth would be playing at the Globe, I jumped at the opportunity to see it performed live by the professionals. Tickets at the Globe can be rather pricey, but the “pit” tickets (i.e. standing room only) are just 5 pounds. You might think that standing for 2-1/2 to 3 hours sounds uncomfortable, and though my feet did start to ache after a while (we’d done a fair amount of walking that day), standing for so long was not only doable, but also a unique experience as we were shoved about and included by the actors in the show. It was definitely one of the highlights for me on our trip! London has definitely impressed me time and time again with the variety and quality of the restaurants in the city. 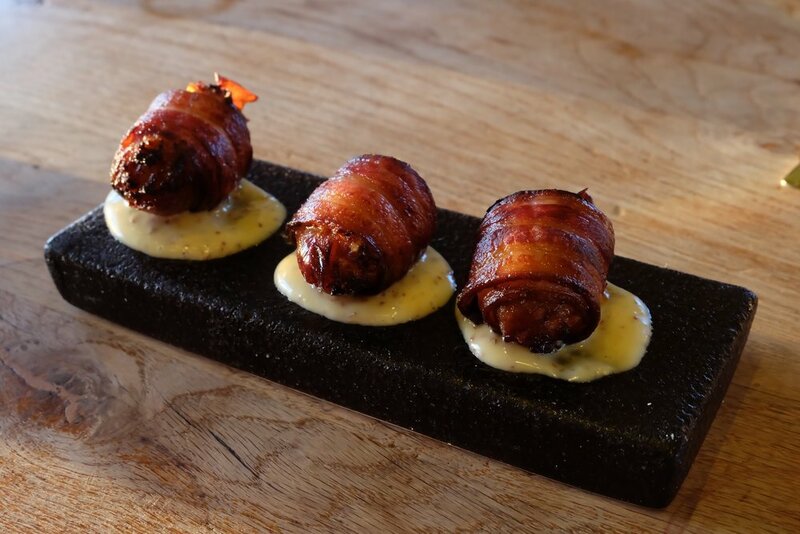 While I could never write just one blog post on the city's culinary offerings, these are the places at which we dined and which I can highly recommend. 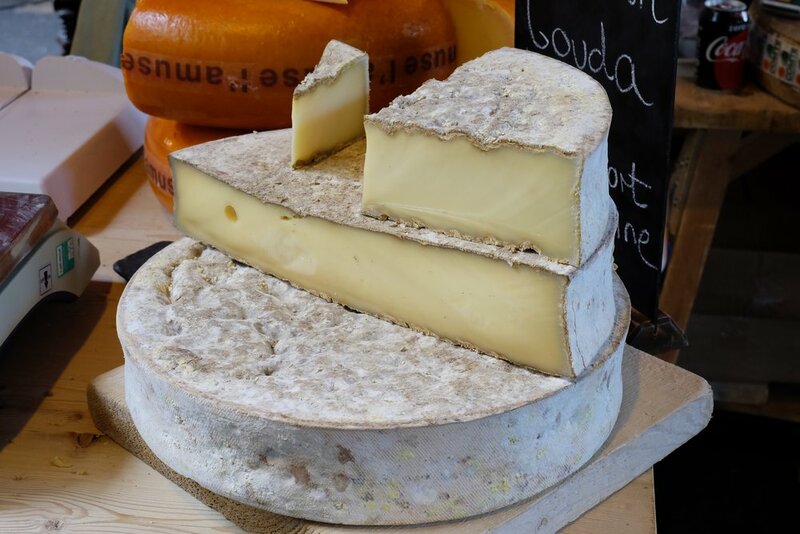 Eating London Food Tour — One of my first searches on any trip is for a food tour. This one, Eating London, is run by the same company with which we toured Amsterdam, and I can say that I’ve had fantastic experiences now with both of them! Emily, our guide, took us on a 3-1/2 hour tour of London’s fascinating East End, telling us plenty of stories and historical details along the way. We got to sample a delicious bacon sandwich at St. John Bread and Wine, bread and butter pudding at the 17th century English Restaurant, real cheddar and stilton at The House of Androuet, fish and chips at the popular Poppies Fish and Chips, real ale and cider at the Pride of Spitalfields pub, three different kinds of curries at Aladin, a mouth-watering salt beef bagel with hot English mustard and a sweet gherkin at the Jewish Beigel Bake, and a trendy salted caramel tart at Pizza East. I enjoyed every food that we tried, learned a lot about London’s history and culture, and got some excellent food recommendations at the end of our tour. I cannot recommend the experience enough! Cinnamon — We returned to Brick Lane for more curry one night after the excellent garlic chili chicken tikka masala that we tried at Aladin on our food tour. Funnily enough, though we wanted to eat at the very popular Aladin, we were deftly redirected to Cinnamon next door where there were tables available. Though we were somewhat disappointed, we decided to stay as Cinnamon also came very highly recommended (I’ve heard they share a kitchen with Aladin). We had papadums with chutneys, garlic naan, the mixed grill plate, garlic chicken, and lamb tikka jalfrezi. The food was very good, and even though I found it odd that the waiter had to go to the convenience store next door to get us beer, we enjoyed the service and our meal. Duck and Waffle — We ate at Duck and Waffle on our first night in London, which in retrospect was an excellent decision. 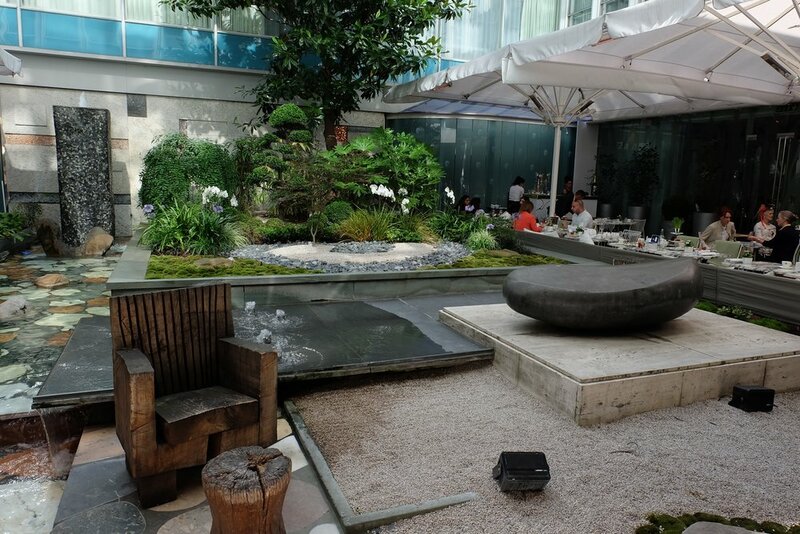 The restaurant is located at the top of a skyscraper with excellent views of the city. The food and drinks were rather expensive, but I really enjoyed the creativity in the dishes. To start, we all ordered some of their very creative "urban foraged" cocktails: the gin-based pine needle lemonade for me, whisky-based colony cocktail with ginger ale for my husband, and hay! with Jack Daniel's and hay infusion for my sister-in-law. 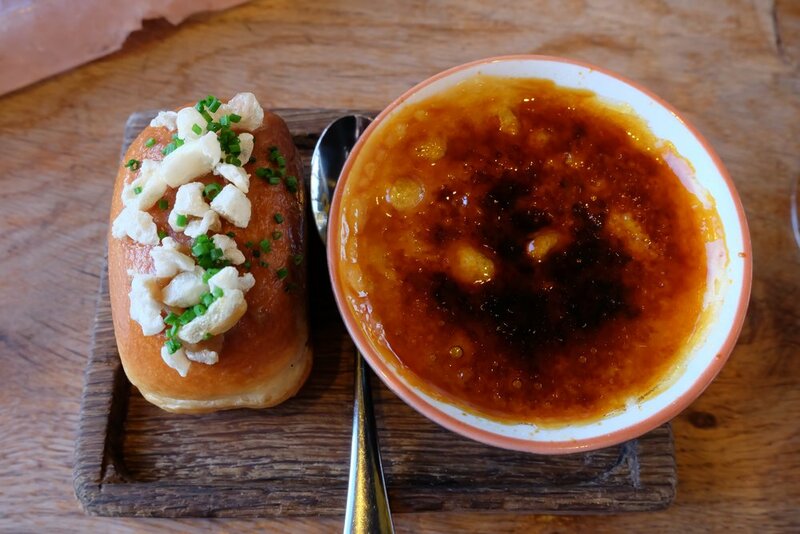 After that, we snacked on a number of small plates, including crispy bacon-wrapped dates, deliciously gooey 'nduja and gruyère bread, yellowfin tuna with watermelon and caviar on a salt slab, angus beef tartare with marmite egg yolk, spicy ox cheek doughnut with apricot jam, foie gras crème brûlée with pork crackling brioche, and corn on the cob with jerk mayo and toasted coconut. Duck and Waffle also offers a number of mains to share, so we got one order of the duck & waffle with mustard maple syrup and another order of the tender 38 day aged angus bone-in rib eye (for two). The duck and waffle was one of the best dishes on the menu; the delicious combination of crispy, tender duck luck, savory fried egg, and sweet mustard maple syrup reminded me of an upscale version of the chicken and waffle dishes that I used to enjoy in the States. Note that the restaurant is open 24/7 -- perfect for night owls. 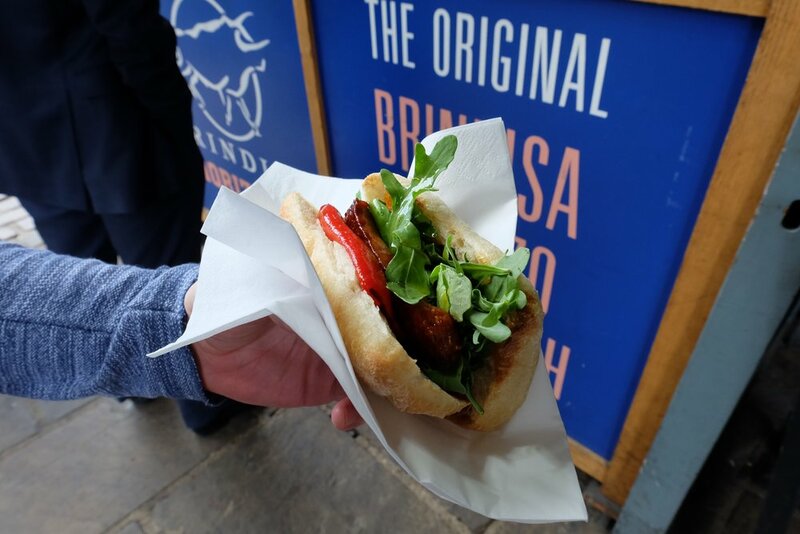 Borough Market Street Food — I love the variety that street-food eating offers, and so one day we decided to check out the Borough Market for their street food. While not as big at Spitalfields, we had some fabulous bites, including the moodog pie with beef, bacon, and Brewdog ale smothered in gravy from Pieminister, crispy fried chorizo sandwich from Brindisa, and mac and gumbo from Hash. My sister- and brother-in-law also got some excellent pork and herb scotch eggs at Scotchtails (which I should have gotten, too). After walking around a bit, we also picked up some creamy fudge from Whirld (including my favorite clotted cream fudge!) and a selection of sausages (including a lovely veal, lemon, and thyme sausage) from Cannon & Cannon to take home for a dinner with friends. 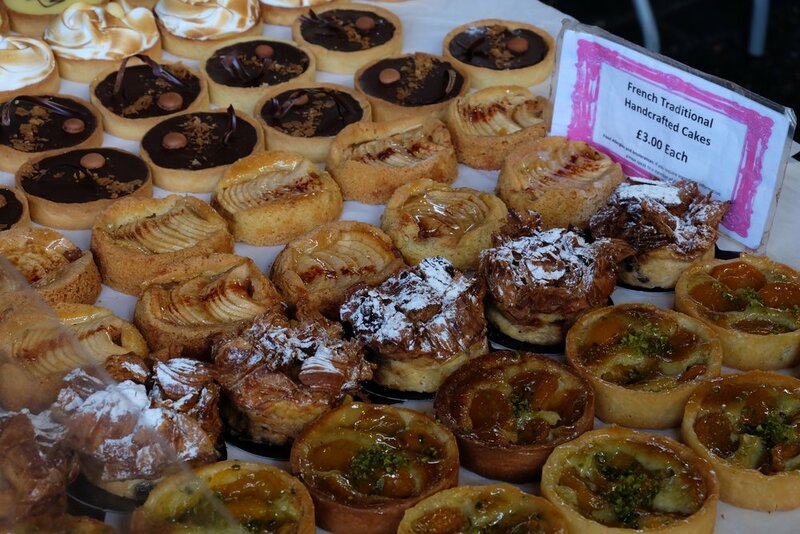 Spitalfields Market Street Food — We visited the Spitalfields market not once, but twice on our trip to soak up all the great street food that London has to offer. I especially liked my crispy duck fat chips with rosemary salt from The Duck Truck, tender carnitas tacos from Al Chile, chicken tikka wrap from Indi-Go, moist red velvet cupcake from Lola's, and sea salt caramel banana doughnut from Crosstown Doughnuts. The street food trucks stay open a little later than the shops, too, if you want to stop by for dinner before a show (as we did before seeing Macbeth). Beer and Buns — One of my favorite meals in London was at Beer and Buns. This hip restaurant near Spitalfields features foosball tables and pinball machines in the second floor restaurant. Their beer list is impressive; I tried the Coede "Kyara" on tap, though they also have several offerings from Asahi, Hitachino, Niigata, and other smaller Japanese breweries. To eat, we went all out and ordered a number of different dishes to share: the chicken karaage buns with yuzu koshu slaw, chashu pork belly buns with red cabbage, ebi katsu bun (fried shrimp) with spicy mayo, bulgogi beef bun with spicy kimchi, Korean hot wings, tebasake soy garlic wings, sweet potato fries with spicy mayo, and salt and pepper chili squid. Each bun was delicious in turn, though I was especially pleased to find the style of fried squid (tentacles and rings) that I just love! Mad Hatter's Tea at the Sanderson — On a previous trip to London, I had an excellent tea at The Orangery at Kensington Palace. 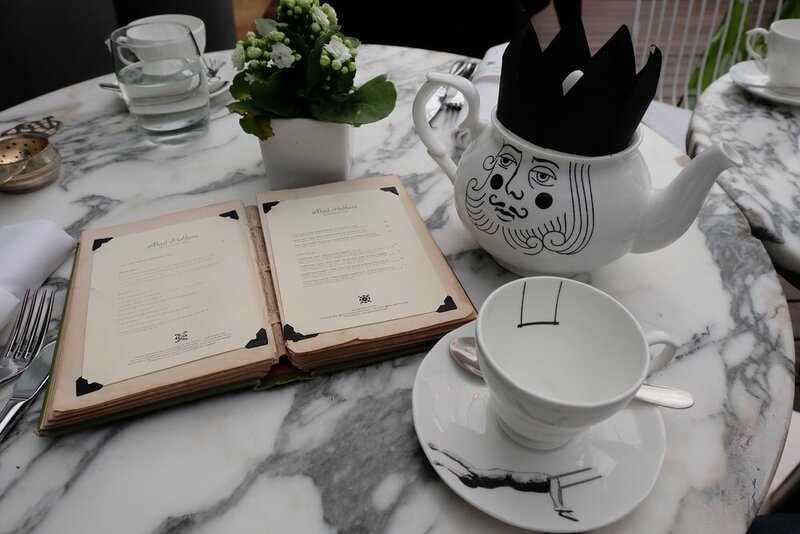 This time, I wanted to try something different, so I decided to indulge my whimsical side with a booking at the Sanderson Hotel for their Mad Hatter's Afternoon Tea. We sipped on their Mad Hatter tea (a green blend), cucumber and cream cheese sandwiches on fresh lime bread, Wiltshire ham and smoked applewood croque-monsieurs, Scottish smoked salmon quail scotch eggs with caviar, Cornish crab and herb eclairs, scones with clotted cream and jam, Wonderland's magic marshmallow mushrooms, blue (chocolate) caterpillars, curious carrot meringues, banana bread-and-butterfly cakes, the White Rabbit's pocket watch (coffee) macarons, the Queen of Hearts oreo cookie soldiers, red velvet ladybirds, Alice's (orange) drink me potion, and passion fruit ice cream flower pots. While you might be surprised by the modern décor of the hotel, they do put on a good show at tea, making the experience worth your while. As much as I enjoyed our time in the bustling city, I had an even more fabulous time exploring the English countryside and Scottish lowlands on our seven-day drive. Follow our adventures in my second post on our UK road-trip.